JamUp Pro is a fantastic, easy to use app. 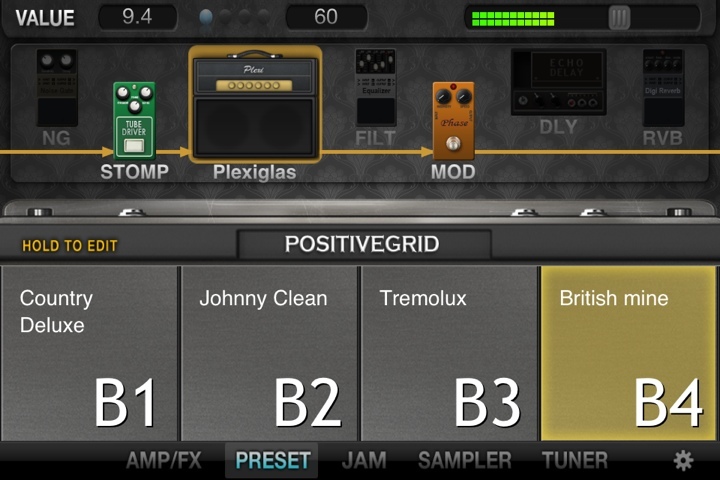 In conjunction with the JamUp Plug I reviewed last month, Positive Grid have provided me a copy of their premiere guitar amp and effects modeling iOS app, JamUp Pro. 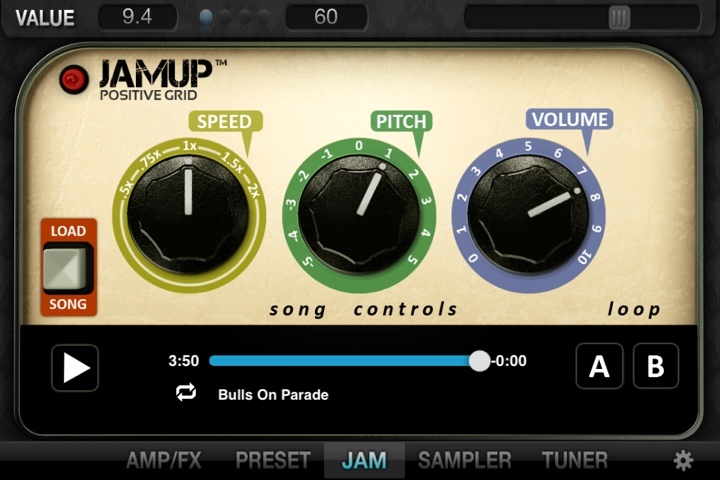 JamUp Pro is one of the newest guitar apps to appear in the iTunes app store, and it has really taken off with a bang. With 6 multi-stage amp models and 14 studio grade effects available from the launch date, and more to come according to Positive Grid, it is great value at $19.99. Positive Grid have used what they call “MESH Modelling Engine” to create the most realistic amplifier and effect models available on iOS devices. the Pro release includes 6 hybrid amp models and 14 studio grade effects pedals/processors. You can use up to seven amp/effects combinations simultaneously. Easy to use drag and drop interface, and up to seven amp/effect combos can be used simultaneously. I used the JamUp Plug that I reviewed earlier to test out JamUp Pro. 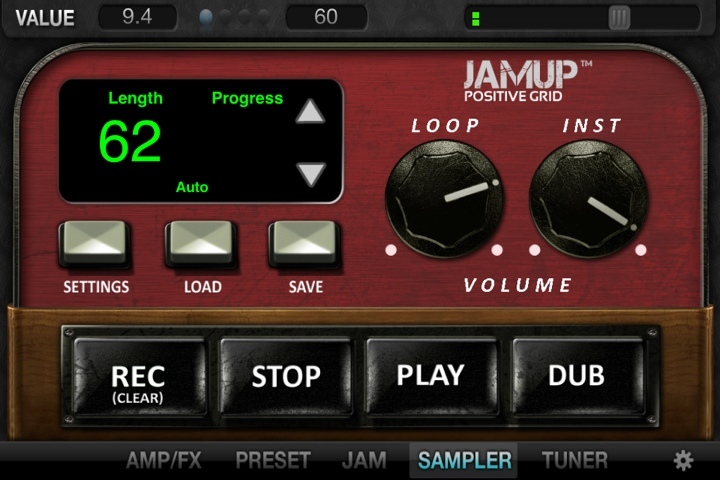 On loading up JamUp Pro you are greeted by the “AMP/FX” screen, with the chosen amplifier in prime view at the bottom half of the screen. Above that you can see the amp/effects chain, with the effects to the left of the amplifier simulating being in front of the amplifier, and the ones on right being in the effects loop. Working with the amps and effects is simple and intuitive, and basically touching and dragging does everything you want. Touch the gain knob on the amp, and turn it with your finger and it reacts just like a real one would. Want to edit on of the effects? Just touch it in the chain at the top of the screen. Turn it off by touching the indicator light, and adjust the knobs just you did on the amplifier. You can easily change the position of the effect by dragging it to your desired location. If you want to change the amplifier or effect you are using just double tap it and the selection screen will come up. Tap the amp/effect you wish to use, and then tap the back arrow. It’s as simple as that. Tonally, JamUp Pro is very impressive. 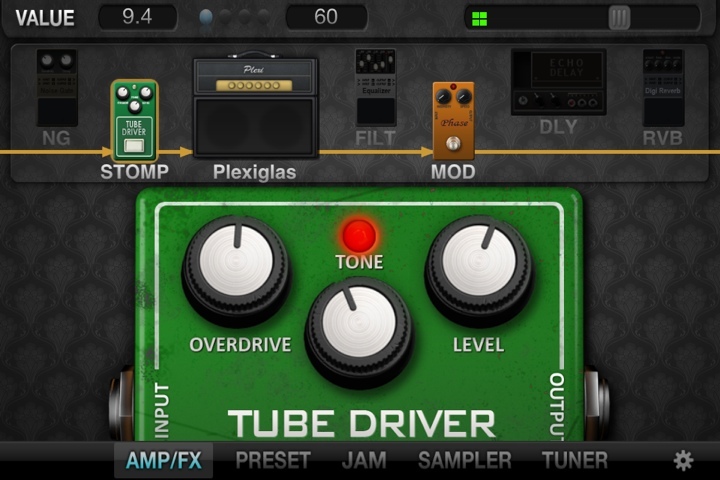 Whilst it will never replace the real counterparts that JamUp Pro emulates, the tones are excellent. The great thing is that the emulated amps respond in a very dynamic way. Play softly when playing through one of the Marshall type models, and there will be less grit. Roll your volume knob down, and the distorted tones will clean up nicely. You will notice the same tonal change from switching pickups that you will from a real amplifier. The effects are all fantastic too. The ones based off famous effects do a great job of emulating their real life partners, and make playing through JamUp Pro a blast. Being able to easily switch their positions in the chain makes experimenting very easy, and a lot of fun. Saving your favourite combinations is easy, with sixteen preset slots to save to. Once you have found some combinations you like you can save them in one of sixteen spots in the “PRESET” screen. Double tap on one of the preset positions, and you will be greeted with a menu giving you options to overwrite and rename, etc. Four presets show on the screen at a time, and a simple swipe gesture left or right will move through each bank of four. Being a fan of amps with dirt, my favourite amp models were the Plexiglas (Marshall® 1959 100-Watt Super Lead Head), the 800 Lead (Marshall® JCM800 2203 100-Watt Head), and the Treadplate (Mesa/Boogie® Dual Rectifier® Head). I loved combining these amp models with the Tube Driver (Ibanez Tube Screamer), Tape Echo (Maestro Echoplex EP-2 Tape Delay), the Custom Flanger, and Phase (MXR Phase 100). Now with just the excellent amp and effect models JamUp Pro would be worth the price of admission, but it’s not all there is to offer. JamUp Pro has a great jamming too - perfect for working on songs or exercises. JamUp Pro has an awesome iTunes jamming function in the “JAM” screen. Load up the song you wish to jam along to, and start playing your guitar. This is all well and good, but there is a lot more functionality than that. Not only can you adjust the volume of the song, but you can adjust the pitch to suit the tuning your guitar is in, and also slow down or speed u if you are trying to work on more complicated parts. This is an incredibly powerful practice tool for anyone, whether you are jamming songs, or working on practice exercises. It’s all just as easy to use as the amp and effect screens, touch what you want to adjust and turn the knobs with your finger. Got some new song ideas you want to put down? Use the handy sampler built right into JamUp Pro. What if you are wanting to put down some new ideas, and need to record multiple parts? JamUp Pro has got you covered. Tap on the “SAMPLER” and you will find a simple to use multi-track recording screen. You can record a part, dub new parts over the top, and play them all back. You can independently adjust the volume of the loops you are playing back, and the parts you are currently playing. They can also be saved on your iPhone/iPad for later use. There's a handy tuner in here to, make sure you are in tune! And last but not least JamUp Pro has a handy tuner built right in. Make sure you are tuned up before playing! 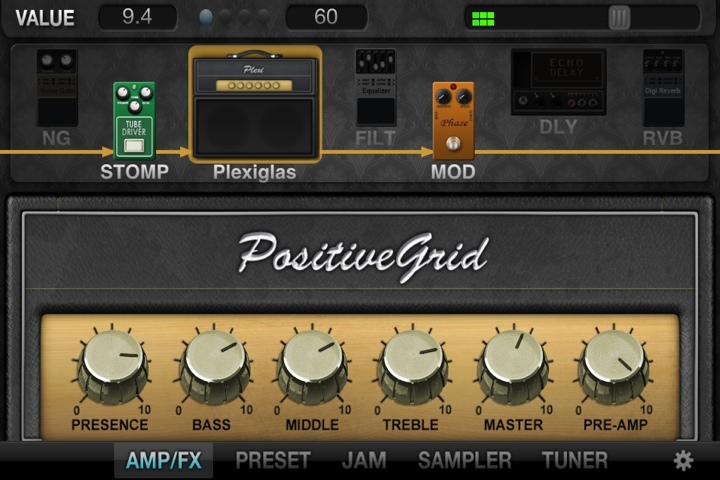 Positive Grid have recently released a new batch of amplifier and effect models as well, which you can purchase in app. I hope to test them out soon. 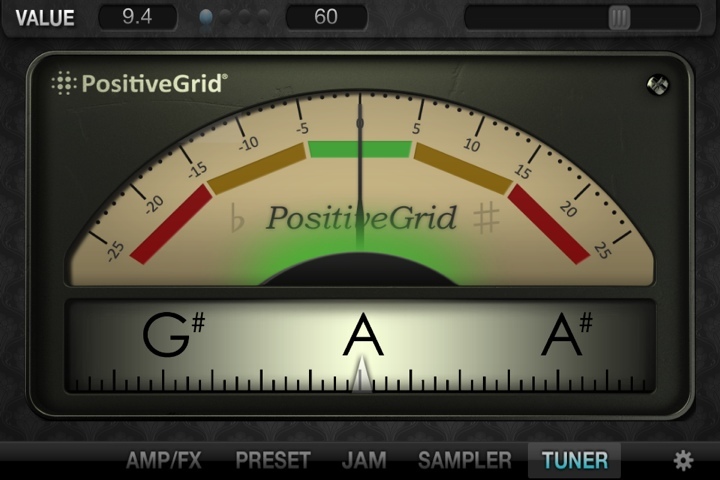 Overall, the Positive Grid JamUp Pro app is an excellent app for guitar player of all levels. The combination of excellent amp and effects models, and handy tools like the iTunes jammer and phrase sampler makes this a very powerful practice tool. If you’ve got an iOS device, and a compatible instrument interface you owe it to yourself to try this right away. If you are unsure there is a lite version of JamUp that you can always try out. It contains less amps and effects, but will give you a taste of the excellent tones that JamUp Pro is capable of providing.